Little did she know she’d be targeted for a ticket, for parking, not stopping to spread some community cheer. Officer Miller wasted no time, it seems, in writing Wood a ticket for parking on the road. Duckworth then attempted to rationalize with the officer, who simply wasn’t standing to reason with the health professional. It must be noted that the roads, neighborhood roads, have no double yellow lines, and may not even be within the jurisdiction of the police department as state maintained roads. Nevertheless, the officer followed through with presenting Wood her ticket and telling her the fine was $25. The heavily redacted video (done so by the police department), doesn’t show the entire interaction, nor the discourse exchanged between the two. But, before leaving, however, Duckworth decided to take the opportunity to lecture Miller on what he could have done. Miller ignored Duckworth, even after he said, “Excuse me!” Again he said, “Excuse me!” and approached Miller on the side of the road. “If you think you’re justified to pull a taser on me, just because you don’t want to answer my question, that’s a bunch of (inaudible),” the healthcare worker said. Duckworth told the officer he’d be hearing from his lawyer and promised not to let the issue go away quietly. To many, who saw the video on Facebook, it seemed like a reasonable request. But to Officer Miller, the law was a little more cut and dry. Stop and get a ticket. 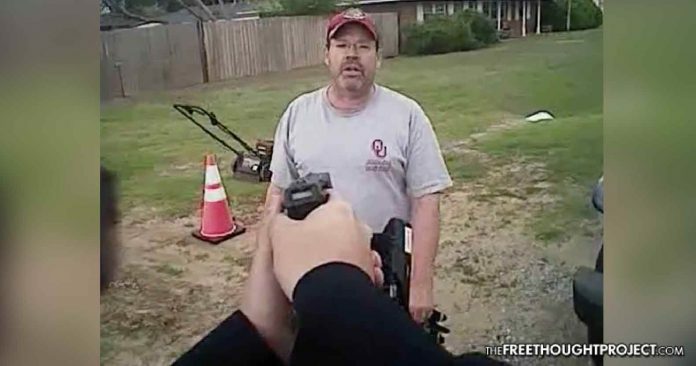 For their part, the North Enid Police Department is standing by their officer, even releasing video footage of the incident and saying an independent committee of community members had reviewed the interaction and concluded, “acted within department policy and his training.” However, after receiving so much backlash, the department pulled the video. It appears as though both the department and the committee agreed that the yardman/physical therapist was a threat deserving of having a taser pointed at him. You decide. Tell us what you think in the comments section below.